Classical design coral stone resort, set in a mahogany grove overlooking a sweeping crescent of golden sand and the Caribbean Sea. A world class premier luxury resort with 112 spacious rooms, conjures up images of glorious exotic setting between the mature mahogany trees and our palladian style building of cream coral limestone, shimmering in the sunlight on the sapphire clear blue waters of the Caribbean Sea. Sandy Lane is a complete resort … where you can be as active as you wish, a romantic retreat for those seeking seclusion, a haven of tranquility for couples, or the perfect location for families. The spacious rooms come with private verandah, have plasma wide-screen television, an interactive entertainment system, stereo, private bar, personal in-room safe, and a convenient telephone system with direct dial access. 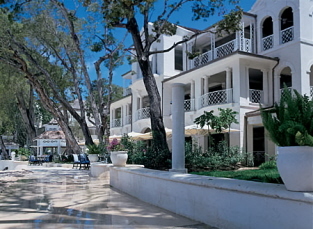 The Fairmont Royal Pavilion was originally The Miramar Hotel, built in the 1940s and the first hotel to be constructed on the West Coast of Barbados. The original structure had only 12 rooms and now houses the Palm Terrace Restaurant. The Café Taboras was once the manager's bungalow and the very private three-bedroom villa part of what was known as the Garden Rooms. In later years came an expansion into a hotel and private residence estate. 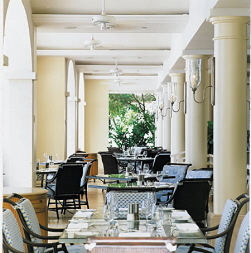 The Miramar was purchased by a private investor in April 1987, who immediately began work on a restoration to transform the hotel into what is today the Fairmont Royal Pavilion. Doors opened in December 1987. The Fairmont Royal Pavillion has been described as 'The Jewel in the Crown of Barbados' - an elegant retreat where you can golf exclusive courses, play tennis, snorkel, sail, water ski and revel in the sun. The hotel is primarily a couple-oriented resort during the high season, with children under 13 years being welcomed during the period of May 01 to October 31 inclusive each year. It sits on the eastern edge of the Caribbean Sea. Oceanfront Fairmont Deluxe Rooms - each room has a private balcony or terrace with a stunning ocean view, along with lounges and a dining table ideal for a quiet in-room dinner. Elegant touches such as marble bathrooms with separate shower, luxury toiletries and fresh flowers, complete the residential feel. All rooms have lounge chairs which create a comfortable seating area, fully stocked mini bar, iron and ironing board, and high speed internet access. 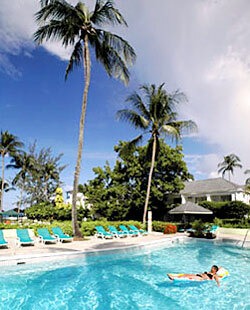 A family-owned hotel, built in 1970, The Sandpiper is the epitome of real Barbadian hospitality. Its landscape is as welcoming as its staff. 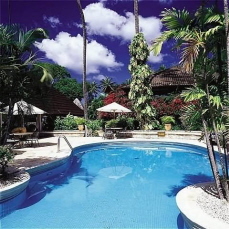 The hotel is set within seven acres of tropical gardens and boasting an idyllic sea-front vista. 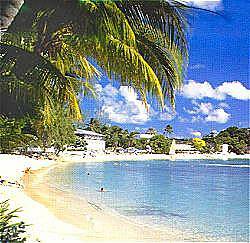 Barbados may be tiny, but its reputation is huge, with its white, sandy beaches, turquoise sea and lush vegetation. The hotel offers hospitality slippers and CD players in every room, cool sorbets delivered to the beach and even home-made cookies in your room at night. Two tree-top suites are available, each with private sun deck and plunge pool. There's a thatched beach bar, pool, complimentary water sports and a world-class restaurant. 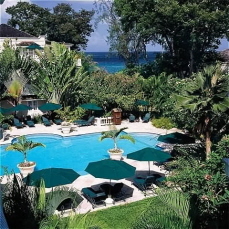 The Coral Reef Club, a family-run hotel, lies within the sheltered west coast of Barbados, was built in 1952 and remodelled in 1999. 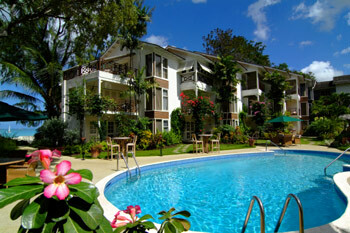 It is surrounded by 12 acres of tropical gardens with a typically relaxed Caribbean atmosphere and superb facilities.. 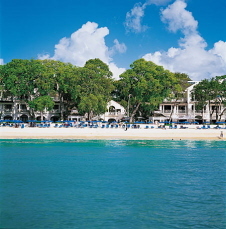 The Settlers Beach Hotel sits on the shores of the Caribbean Sea in Holetown, Barbados, a charming historic city, once known as Jamestown after King James I, was the first settlement on the island. The arrival of settlers to Barbados in 1627 is commemorated every February during the Holetown Festival. Visitors and locals alike can enjoy concerts, antique car parades and historical lectures. The Settlers Beach Hotel is located a half mile from the city and is also within walking distance of excellent restaurants, a bank, post office and intriguing local storefronts. The Settlers Beach Hotel features a sandy swimming beach and freshwater pool. The on-site restaurant, Bistro Too, offers fine food at a picturesque dining area overlooking the crescent-shaped Settler's Beach. Weekly cocktail parties with complimentary drinks offer guests the opportunity to socialize and meet other travelers. The hotel can arrange activities including horseback riding and ecological tours. There are 22 air-conditioned villas, distributed spaciously throughout the grounds. The guestrooms feature immaculate white designs and furnishings, and all suites include balconies or porches. Situated on Barbados' famous St.James beach, with gracious accommodation and activities to accommodate your every pleasure, Discovery Bay is dedicated to making your tropical vacation truly memorable. This is your place in the sun, relaxed but exciting; soothing but stimulating; casual but elegant. 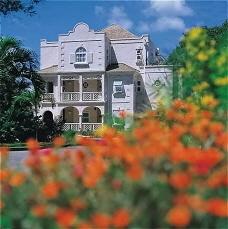 The plantation-style house and gardens are positioned on St. James beach, on the fashionable West coast of the island. Days at Discovery Bay are centered on the beach, the pool and the Sugarbird Bar and Grill. Swim out to the hotel’s raft to work on your tan or enjoy a range of beauty treatments and massage at the Salon. Evenings bring the opportunity to enjoy authentic Bajan cuisine, alongside international favourites at the hotel’s informal Garden restaurant, with buffet-style and table d’hote menus. After dinner the Lobby Bar comes alive, with a varied selection of entertainment including steel pan and local bands. All 88 guest rooms are non-smoking, as well the hotel will become an adult-only (age 16+) resort from the 15th of January 2008. There's a meal plan, dress code and complimentary tennis. Extra charges for water-skiing, snorkeling, scuba-diving, massage treatments and golf. The ground-floor only restaurants and bars make it a particularly suitable resort for guests with restricted physical abilities. This elegant, colonial style hotel with it's beautiful freshwater pool provides a perfect backdrop for a wedding ceremony and larger wedding parties will enjoy the variety of things to see and do both at Discovery Bay and along the coast. Treasure Beach Hotel, a little gem and a surprisingly well-kept secret, is an all inclusive luxury hotel offering a stunning location and quiet, intimate charm. 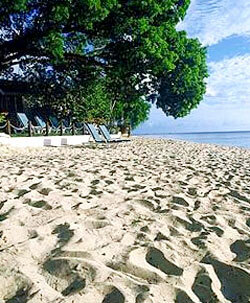 It is located on one of the Island's best white sand beaches, and is set in lush, tropical gardens. It first opened its doors in October 1977. Since then it has established itself as the premier boutique hotel in the Caribbean. The 35-room hotel offers luxury suites that look out to either the beautiful Caribbean Sea, the exquisite pool or well tendered gardens. Delicious offerings from the kitchen make the Al Fresco Restaurant a must where fresh local ingredients, numerous accolades and dining under the stars are considered the norm. 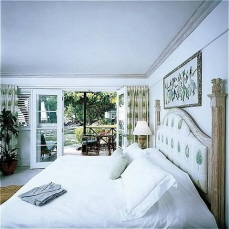 The Hibiscus, The Hummingbird, and the renowned Hemingway Suite, are ideal for a romantic honeymoon retreat.